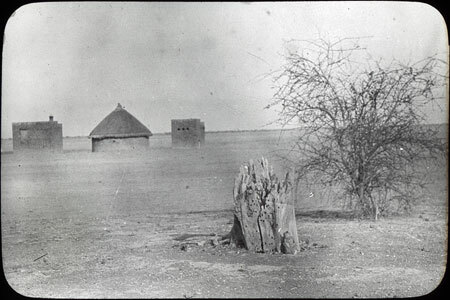 The site of a Shilluk grave-shrine (kengo) of the deceased twelfth Reth (king) Nyadwai. The grave, a small circular fence around it, is not visible in this image. Although no larger enclosure was standing when this photograph was taken, the old tree stump in the foreground was revered as sacred, and a young tree (right) also respected and associated with the shrine. Such grave-shrines were closely connected with the spirit Nyakang, the founder of the Shilluk nation, since the Reth was considered an incarnation of Nyakang. In the background can be seen Government offices and houses of Kodok. Manual catalogue entry (thermofax catalogue copy in folder '27-06 Seligman Slide Collection') - "V.e.47 Shilluk. Nyadwai's tree at Kodok (283)" Additional note ms ink (1967) - "mottled shading"
Note on lantern slide ms ink - "V.e.47 Shilluk. Nyadwai's tree at Kodok. 283. CGS"
Morton, Chris. "Shilluk grave-shrine " Southern Sudan Project (in development). 03 Jan. 2006. Pitt Rivers Museum. <http://southernsudan.prm.ox.ac.uk/details/1967.26.194/>.